WASHINGTON (CNS) — A coalition of interfaith leaders from the InterFaith Conference of Metropolitan Washington gathered at the Cathedral of St. Matthew the Apostle in Washington on Jan. 31 to announce a vision statement for religious communities in the local area. The statement, released a day before the start of the United Nations’ annual World Harmony Faith Week, “arises from (the communities’) trust in God and belief that good government is exercised ‘under God. '” It also called upon their belief in “our responsibility to serve humanity,” which calls them into community. The news conference opened with prayers given by Episcopal Bishop Mariann Budde of Washington and Imam Talib Shareef from the Masjid Muhammad, the Nation’s Mosque, who also is the conference’s president. Cardinal Donald W. Wuerl of Washington and other faith leaders also were present. “This picture we have up here is a beautiful picture of our city” and of our nation, said Imam Sahreef, referring to the different religious leaders standing side by side. In his remarks, Rabbi Gerald Serotta, executive director of the conference, noted the interfaith group was founded in 1978 and since then has “advocated for the rights of each religious community to freely practice its faith without fear or intimidation.” The conference includes leaders from several Christian denominations, as well as representatives of the Sikh, Zoroastrian, Mormon, Jewish, Hindu, Jain, Muslim and Baha’i faith communities. 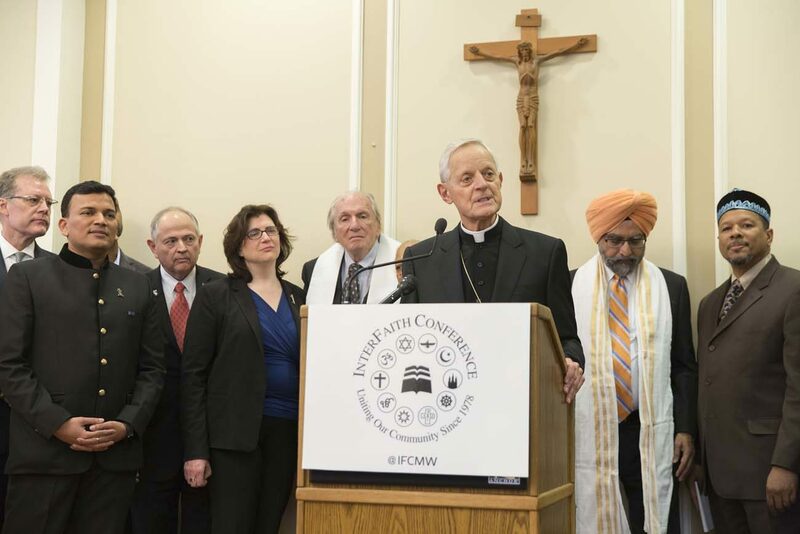 The group’s statement was inspired by a charge led by Cardinal Wuerl last May, when he spoke to the faith leaders, encouraging them to “amplify the voice of the interfaith community speaking to the spiritual welfare of our Washington-area community,” said Rabbi Serotta. Through the statement, the religious communities outlined seven values that they all committed to, and invited all area businesses, organizations, government entities and individuals to join them. The values are to: be a good neighbor; value life; value families and the safety and nurturing of children; value quality education for all; aspire to meaningful vocations and a living wage; embrace mutually beneficial commerce that serves the common good; and promote responsible environmental stewardship. The statement particularly emphasized the need to care for one’s neighbor and said there are moral requirements for society. Cardinal Wuerl pointed out that the group had been crafting the statement for several months, and it was not merely a reaction to current events. Nevertheless, the faith leaders did comment on how the values outlined in their statement relate to President Donald Trump’s Jan. 27 executive memorandum keeping refugees hailing from seven majority-Muslim countries — Syria, Iraq, Iran, Sudan, Libya, Yemen and Somalia — from coming in to the United States for 90 days. His action suspended the entire U.S. refugee resettlement program for 120 days. “While the statement we present today does not speak to any specific public policy, we firmly insist that the values that we emphasize today must play an important part in our community’s life,” said Rabbi Serotta. Cardinal Wuerl said these values are fundamental to the nation, and also come out of the wisdom of the faith communities that were gathered there. The conference is launching a new program called “Washington Interfaith Response and Outreach Coalition” out of a concern for the targeting of faith and ethnic communities in the local area. It will provide rapid response and programming for any of these communities who experience discrimination. “There is a light, and there is a possibility of a much, much better world,” he said.